My family brought home a Shiba Inu puppy a few weeks ago and she is so adorable(and a little feisty). 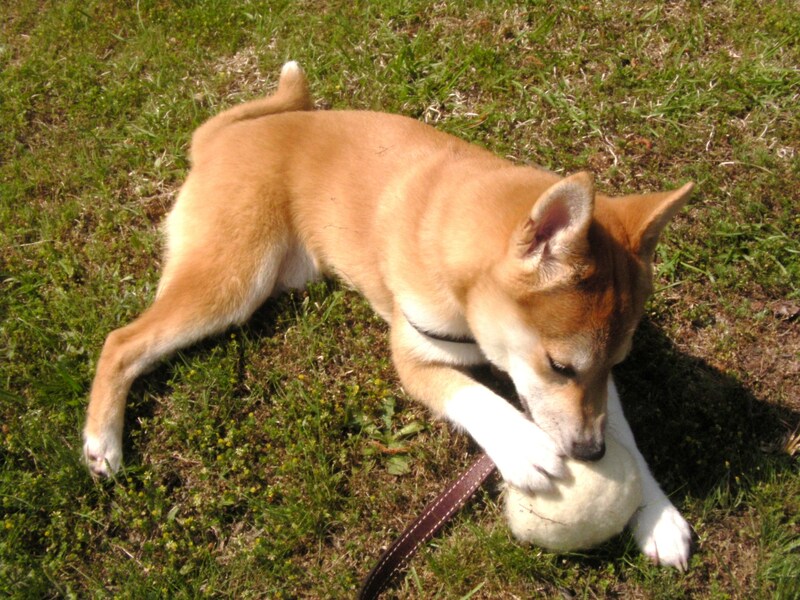 Shiba pups are very energetic and love to chew things, like an antique cedar chest and sewing machine. Yes, my face turned bright red when I saw her chewing items that my family had passed on through the generations; but thankfully my husband remembered that puppies love the smell of wool! 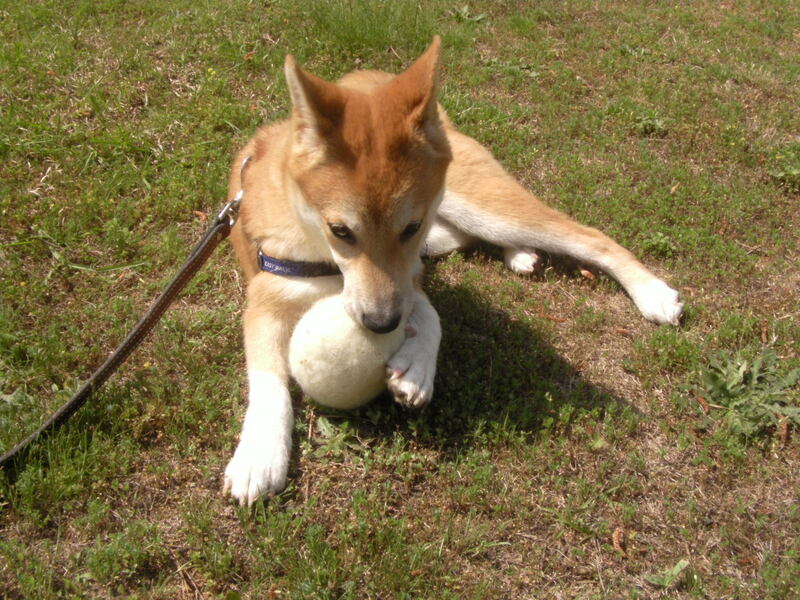 I pulled out a rather large wet felted ball and tossed it at my eager pup. Instant Success!!! She goes absolutely nuts for this ball. Tugging little pieces off of it and chasing it around. When you give a puppy something acceptable and fun to chew on, believe it or not they usually leave your prized possessions alone! Little tufts of wool are all over my carpet but I don’t mind. I would much rather have a daily routine of cleaning my floor than try to repair antique furniture. The fact that the toy is semi-destructible seems to make it more fun for the pup. She wants to see the damage that she causes to the ball! At first I was worried about fur balls, but she basically gnaws at the ball and when she can pull out a tuft of wool she tosses it to the side. She is not interested in eating the ball, just destroying it! When the ball becomes loose and tattered looking, I just wet felt it again. And she gets a fresh toy ready to destroy all over again. And she hasn’t touched my antique furniture ever since she has received this ball! 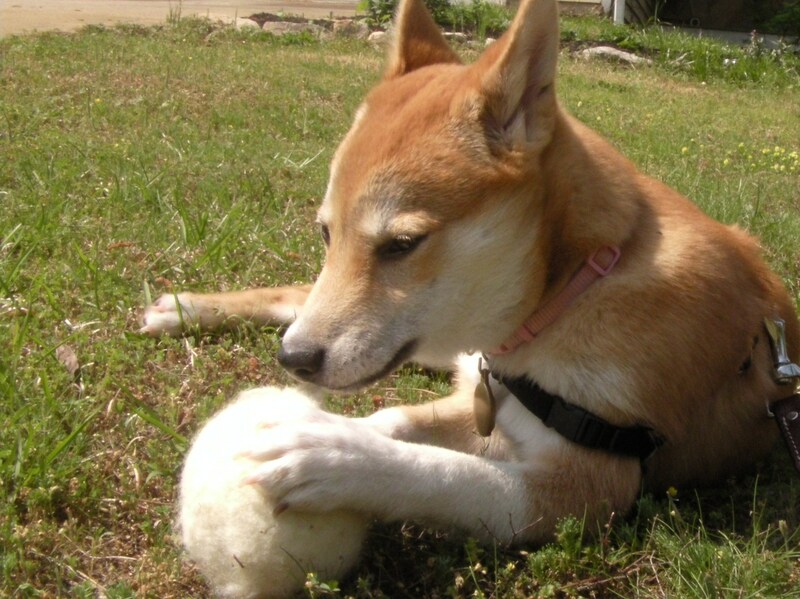 If you have a pup in the nonstop chew phase, try to make a wet felted ball for it to pounce and destroy. You will be glad you’ve made such a small effort. Check out my tutorial on wet felted balls, if you have never done it before. It is a very easy process and within a few hours your pup with be chewing on something acceptable. Then you can focus on building a bond with your puppy, rather than reprimanding her. It’s a win win. Give it a shot!